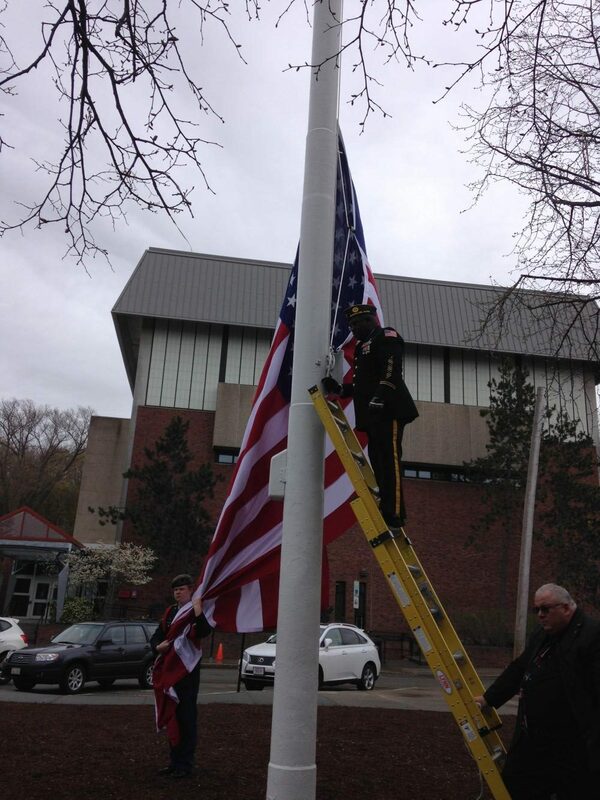 Elmon Hendrickson, Commander of the Brookline American Legion Post 11, raising the U.S. flag. 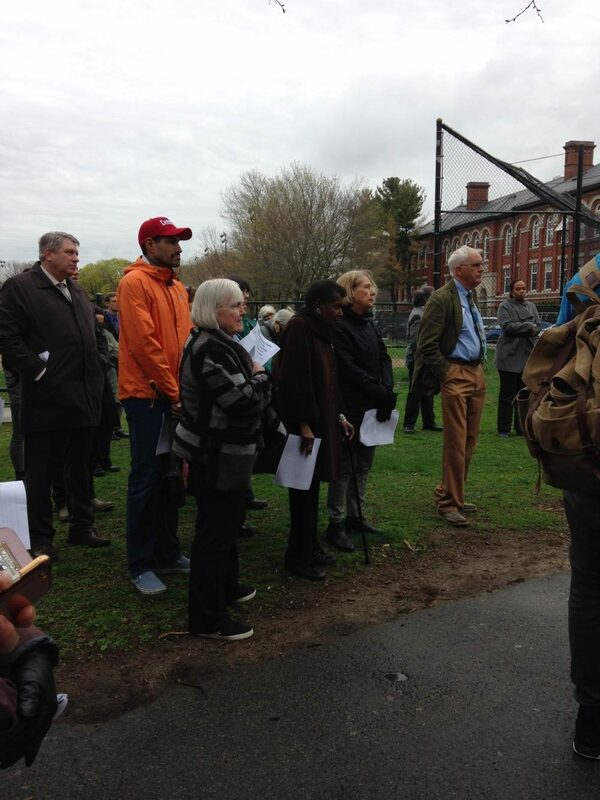 On Tuesday, students, teachers and members of the Brookline community came together for a flag-raising ceremony on Cypress Field honoring Adam, Peter and Prince, three slaves from Brookline who fought in the Revolutionary War at the Battle of Lexington. After an introduction from history teacher Malcolm Cawthorne, who emceed, Town Meeting Member and Vietnam veteran Neil Gordon read the Board of Selectmen’s Proclamation. Gordon said that we must acknowledge the past even if we cannot change it. Several high school students participated throughout the ceremony, starting with junior Karina Lorenzo’s reading from the Declaration of Independence. Her recitation was skillful and moving. Next, Barbara B. Brown, Ph.D in African Studies Center at Boston University, spoke. She pointed out that the honored men were only three among 80 slaves in Brookline at the time of the Revolutionary War. According to Brown, all we know of Prince besides the fact that he fought in the war was that he ran away and was successful. Cawthorne held up a sign showing the ad Prince’s owner, Joshua Boylston, posted in hopes of finding him. The sign was met with cheers and clapping from the crowd. Brown finished by speaking about unity and acceptance of the men. Under Brown’s lead, the crowd said the names of Adam, Peter and Prince together aloud. Cawthorne introduced the flag raising, which was performed by Commander of the Brookline American Legion Post 11 Elmon Hendrickson. Following the flag raising, John Bassett played “TAPS” on the bugle, and the crowd stood together for a meaningful moment of silence. Cawthorne finished the ceremony with closing remarks. He said that we should feel proud Brookline is attempting to correct the abuses of our history, but that we also need to be aware.